Was born in 1969 in Almaty. Has graduated from Moscow State University named after M.V. Lomonosov, High Academy of Governance under the President of Kazakhstan and Georgetown University (USA). Till 2002 worked as the member of Supreme Economic Council under the President of the Republic of Kazakhstan, at the Administration of the President of the Republic of Kazakhstan, served as Chairman of the Agency for Strategic Planning, First Vice-Minister of Finance of the Republic of Kazakhstan. From 2002 to 2006 served as Minister of Economy and Budget Planning of the Republic of Kazakhstan. In 2006 served as CEO of Kazyna Sustainable Development Fund (the state institutions of development). In January 2008 appointed as Head of Administration of the President of the Republic of Kazakhstan. 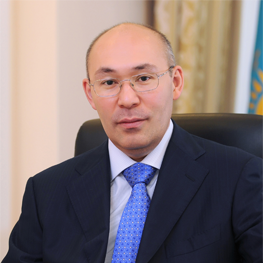 Since 2008 to 2011 – CEO of Sovereign Wealth Fund “Samruk-Kazyna” JSC (The Fund, which consolidated all the state companies). In April 2011 served as Minister of Economic Development and Trade of the Republic of Kazakhstan. In January 2012 was appointed as the Deputy Prime Minister of the Republic of Kazakhstan, where governed the issues of macroeconomics, budget policy, governing of state companies and finance sector, tax and custom regulations and etc. Kelimbetov also served as the Chairman of the Council of Eurasian Economic Comission, where he represented the Republic of Kazakhstan. On October 1, 2013 by the Decree of the President of the Republic of Kazakhstan was appointed as the Chairman of the National Bank of Kazakhstan. On December 24, 2015 by the order of the President of the Republic of Kazakhstan was appointed as the Governor of Astana International Financial Centre.